Like the NHL general managers and scouts who’ve trekked to Agganis Arena –and Denver’s Magness Arena—to see Terrier co-captain and undrafted free agent Matt Gilroy, the national media have also taken notice of BU's walk-on turned two-time All-American defenseman. Earlier this week, we linked to a Toronto Sun article detailing the Leafs' interest in being a serious bidder for Gilroy’s services once his BU career ends. Yesterday, Matt was one of Sports Illustrated’s Faces in the Crowd. 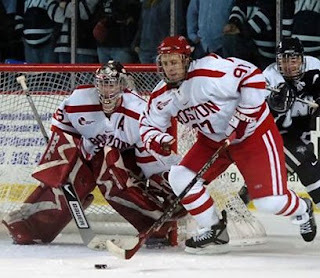 Now, New York Times sports columnist George Vescey has profiled Gilroy, retelling the now-familiar-to-BU-fans story of how Gilroy, a late bloomer, ended up at BU and the childhood promise behind his #97 uniform. Vescey’s column appears in tomorrow’s Times print edition. ► Both games in BU’s home-and-home series with New Hampshire this weekend will air on NESN with Friday’s contest beginning at 7:30 p.m. and Saturday’s at 7:00 p.m. Due to the league’s contract with NESN, the will be no All-Access Webcast of Friday’s game at Agganis Arena, but it will air on WZZN radio and online. NESN offers a preview of the matchup. ►BU's performance thus far and its post-season prospect were on tap in this weeks Inside College Hockey podcast featurng the site's editors. ► Boomer Ewing scored a goal and two assists for the victorious American Division in last night's ECHL All-Star game in Reading, Pa.